Easeus make a free utility that allows you to roll back to your previous Windows Operating System. I have tried it and it worked easily and simply with my test system. I have yet to upgrade, was a little reluctant as not trusting of Windows Roll Back. I already see quite a few people with resulting problem systems. Think I will hang it out for a couple of months. Azari, did you download it before or after you upgraded to Win10? I've upgraded two Windows 8.1 Pro systems. One had some problems that I was able to fix then complete the upgrade.I used the built-in Rollback to return to 8.1 and surprise, it worked. The other went perfect, 50 minutes start to finish. Edit: By the way, that's a free trial, not free software. The built-in rollback Win10 has? The EaseUS System Rollback Free (Trial). As we will probable get many OPs having problems, perhaps G2G How To for upgrading could be written that we could all point too. 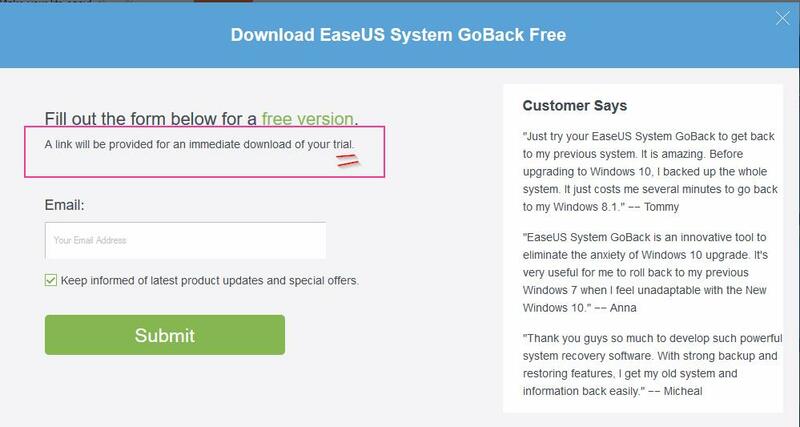 Dear admin, easeus system backup is free. not trial. It may depend on the site that you have visited, as there are 3 versions of Todo Backup. Strike out is regular price and Blue is Buy Now price. I just checked them now at their site. Not unlike Piriform Speccy prices. I think these are the ones that azarl means .. So I will defer an answer back to azarl, as it is his topic. I am not 100% sure if this is part of the tool that we are talking about, but it is listed at the bottom of the page linked. It calls itself Backup for laptops and PC's and sorry if I have the wrong one. Edited by noknojon, 11 August 2015 - 03:15 PM. On start up my internal Data drive was selected as the destination, I would think that if only the C: drive was seen, I would have been asked for a destination. It took over 6 hours to write the files, 139GB, the entire disk, so I think I will stay with Macrium and take a drive image. The Go Back button informs you the existing OS will be overwritten. I did not proceed.